I’ve known David for a number of years and just like everyone else, I am blown away by his voice. Curiously however, I have always been more impressed by David Phelps, the dad, the husband, the friend … and the conversationalist. He is witty, smart and humble. Read below and see for yourself! 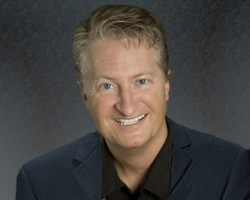 ANDY ANDREWS: David, is there anything you tend to hide in the refrigerator so that no one else can get to it before you? 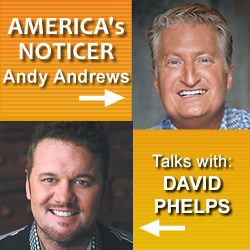 DAVID PHELPS: Coffee creamer. My day is offto a rocky start without it. were you aware that your voice was “unusual”? DAVID: I grew up in a musical family. We all sang, so really, I just thought everyone else could sing, too. I chose football over singing until high school when a lot of the football team decided to join the choir. I had taken piano and could read music so that was right up my alley. ANDY: What might I be surprised to find on your iPod? DAVID: Well, I share an account with my kids, so sometimes when it’s on shuffle, even I’m surprised. Everything from Katy Perry to Lynyrd Skynyrd to Tony Bennett to Karen Carpenter to Beyoncé to the Civil Wars to Adele to Queen to who knows what. ANDY: Do you have a hobby? DAVID: I do some woodworking when I have time; we keep horses, and I hunt and fish with my boys. ANDY: Good for you! So do I! Hey, when you were 10 or 12, what did you think you’d grow up to be? ANDY: David, so many people are awed by you … I wonder, who awes you and why? DAVID: I have to say my dad. He is patient and kind to what I have decided is an unattainable degree. My running joke is: “I have given up trying to be like Dad, I think I’ll just shoot for trying to be like Jesus instead.” (Andy laughing) Of course, he scoffs at that like any good saint would. Others awe me from time to time, but this thing with my dad is chronic. ANDY: What is your favorite old television show? DAVID: No question … "Bewitched." ANDY: Really? It’s my wife’s favorite, too! In fact, the "Bewitched" theme song is the ringtone on Polly’s cell phone. DAVID: Oh, yeah. Tons! I have an ongoing list titled, “Songs I Wish I’d Written.” There’s “I Will Be Free,” “I Love the Lord,” “What Sin,” “Time To Say Goodbye”… these are all on the list ... mainly because they move me. Another song on the list was “We Shall Behold Him.” But, I just recorded that on my new project! So I can check it off! DAVID: I’m not sure I understand your question correctly, but I would kill Wes Hampton to do a duet with Celine Dion. (Andy is on the floor laughing!) Oh ... I get it now ... Celine Dion. ANDY: OK, let me catch my breath. One more question: If Lori could change one thing about you, what would it be? DAVID: Probably my intensity. Everything is urgent and has to be done right now. Her “hurry bone” broke a long time ago. We balance each other out.